Give your bedroom a charming update with this comforter and sheet set. Featuring an intricate medallion pattern in warm tones of yellow and grey, the set offers beautiful elegance for any decor. The warm fabric and filling ensure a cozy night, and the set is machine washable for easy cleaning. Comforter, shams and bedskirt are soft and luxurious feeling. Pillow is lovely accent piece. The sheets match beautifully but are a little rough in texture. I hope when they are laundered they will soften up a bit. 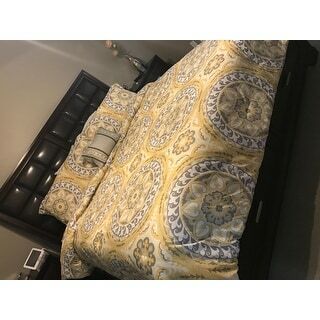 I've bought comforter sets from places like bed bath and beyond .... expensive of course but those sets don't include fitted or flat sheet ... this set includes all that you need plus cheaper than other places. Great quality will buy more sets in the future. However, I give it a 4 only because in the picture the yellow seemed like a pale yellow. mmm. No it's a mustard yellow which wasn't what I was looking for but I kept it Anyways. I had been researching a new bedspread for weeks before I bought this item. I was concerned that I would either be too hot, or too cold, depending on the thickness of the comforter, and wouldn't we happy with the actual design once I saw it in person. My commitment hesitations were appeased when I started using this, though. I absolutely LOVE the design--it is all that I had imagined (and it legitimately matches the picture.) Once the positive feelings from my pleasant visual encounter with the design faded, I worried that the bedding would be too...light. It wasn't. It is a good mixture between winter-warm and summer-cool. I can always add another blanket to the mix if needed, and don't have to worry about being smothered or suffocating. Overall, I recommend this product, and am extremely pleased (and relieved) with my purchase. I absolutely love this set. The colors are true to the picture and it's a really good deal. The sheets have deep pockets and fit the bed nicely. I would highly recommend this set. The cotton sheets were more comfortable and soft as I washed them. The pattern contrast of the sheets to the comforter is very stylish. I would recommend this set to add a pop of color in the bedroom. I bought this set a month ago, and have washed it a few times. It washed well and looks beautiful on the bed. My only complaint is that the sheet set needs ironing every time it's washed. It is very wrinkled from the dryer even though I use fabric softener and dryer balls. The comforter and shams are no problem. 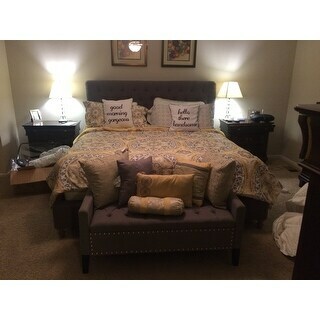 Have enjoyed this comforter set in the guest room. It's bright and cheery and I paired with the gray fabric headboard like shown in the display. I've used in over a year now and it still looks good. Absolutely love this set! Beautiful colors and the comforter and sheets are so soft! I love this comforter! It is very light weight and soft but very warm! This set fits perfectly and is of good quality for the price. It's a nice way to add that extra touch to your bedroom without breaking your budget. The comforter is actually really warm, it is a great set at an affordable price. I would definitely buy again. 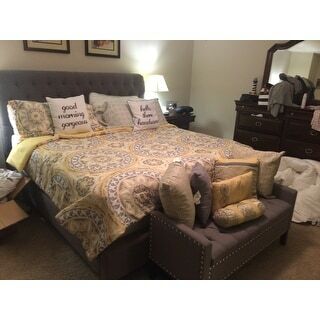 Loved this, the yellow and grey are a perfect match for our bedroom decor. The material is soft and print is lovely. Very happy with the purchase. It was everything I was hoping it to be! Colors were as described. Stuffing seems to stay in place well. Very happy with the product! This sits in my guest room. All pieces are well made and color is really serene. Very comfortable and not too warm. Love the colors and it washes up nicely. It provides a focal point for the bedroom. Delivered quickly and we love it. 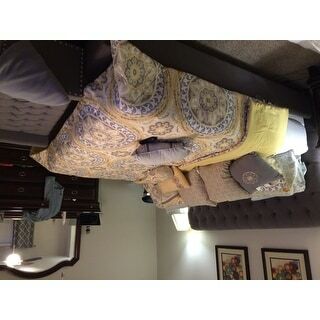 Really lovely yellow and gray comforter set. Goes great with my cabin which is mostly browns but adds a pop of color and modernism to the rustic style of the room. Highly recommend! I purchased this comforter for our bedroom for the summertime. It looked great in the room. I was surprised by the quality as this was very affordable. It was a nice surprise as you always take a chance when you order online. "I would love to get this for my college dorm room! I have been eyeing this item for months now. my only concern is that there is no Twin XL. should I go with the twin size or the queen? I am so torn and scared to order the wrong size." "Can you recommend window treatment that would match? Curtains? Valance?" "Has the comforter held up well to multiple washings?" Care instructions: Machine wash cold, Gentle cycle, and separately. Do not bleach. Tumble dry low,remove promptly, do not iron. If there is no free movement in the washer or dryer,use large capacity commercial washer/dryer. "Is there a different listing for just the comforter alone?" Unfortunately, it only comes as a set. "Hello, Is this a Twin Xl? Thank you, Jennifer "
No, it's a queen size. No they didn't have any twin. It barely fitted my daughter's queen size bed..
"Are the colors yellow and tan or yellow and grey?" I purchased for my daughter and she loves it. The colors are yellow and gray. I have this on my bed as we speak .. It has grey and tan colors. I would say different shade of grey and tan in some of the designes. Love this quilt. "I have a queen bed, will a full set be too small for my bed?" The full size set will be too small for your queen size bed. The size I purchased was a double set and the sheets are roomy but I am unsure they would fit a queen. The full-size set will be too small for a queen bed.